It's been 14 years since the GP 4000 was first conceived. In that time it has had two updates and established itself as the undisputed best all-rounder in the field, creating an entire new performance level and benchmark for all other race clinchers to be tested against. Ride faster, more comfortable and with increased puncture protection. The 5000 is not a facelift with a new hot patch/sticker, it is a new tyre from the ground up. The 5000 marks a new chapter for Continental, introducing their first road Tubeless Tyre, the 5000 TL. The TL technology is specifically designed to offer Tubeless for road cycling demands. Easy to install and reliable to use. Tubeless Bead Specifically developed, the tubeless bead seals through its unique shape and provides stable fitting on the rim. 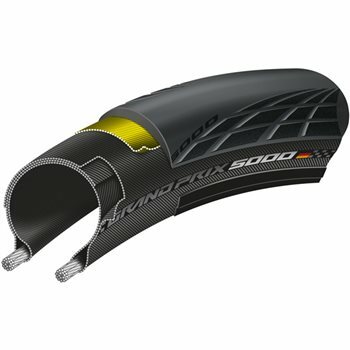 5% lower rolling resistance and 5% better puncture resistance over the GP 5000 clincher. 12% less rolling resistance than the 4000SII. 20% boost in puncture protection. 5g lighter than the 4000S II 700x25C. Active Comfort Technology - Embedded in the tyre construction the Active Comfort Technology absorbs vibrations and smoothens your ride. Lazer Grip - the lazered micro profile structure expands over the tyres shoulder and provides outstanding cornering. New BlackChili Compound - visually blacker, the new mix of BlackChili aids reduction of rolling resistance and increased grip. Recommend pairing with Conti Revosealant. Constructed from 3 plies, totalling 180Tpi.